Send USPS Certified Mail® inside our USPS approved Certified-Mail-Envelopes with Electronic Return Receipt for $4.52 vs the old fashioned green card that costs $6.74. 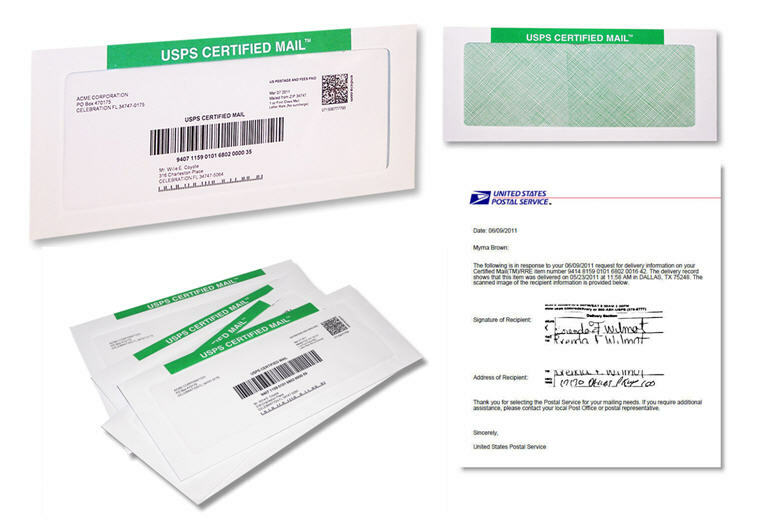 Certified Mail Envelopes are approved by the U.S. Postal Service to send USPS Certified Mail® . Each envelope includes a proof of mailing manifest, in-route letter tracking and final Electronic Return Receipt ERR™ that provides USPS proof of letter delivery confirmation. No forms or stickers are used in our automation. Log into our website to address your letter or upload an Excel address list. Our automation prints all the USPS Certified Mail bar codes and tracking information for each letter. We call this the Address Sheet. We also print the paperwork required by USPS for acceptance including the postage statement. Slide the Address Sheet into our special Certified Mail Envelope with your letter. Finally drop the letter into the USPS Mail stream. Our automated tracking provides USPS mail manifest reports, ’in-route’ letter tracking and final USPS delivery confirmation. You can print Electronic Return Receipts or USPS Certified Mail® Signatures for each letter. Approved by the U.S. Postal Service (USPS). Send 1 letter or 100,000 letters as needed. No forms or peel and stick labels are used. Our Certified-Mail-Envelopes are USPS approved and include Electronic Return Receipt delivery confirmation authored by the United States Postal Service. You can purchase Certified Mail® Envelopes as needed. Our process can be automated and supports CSV and Excel file processing. No more forms, or peel and stick labels. No software to purchase or maintain. 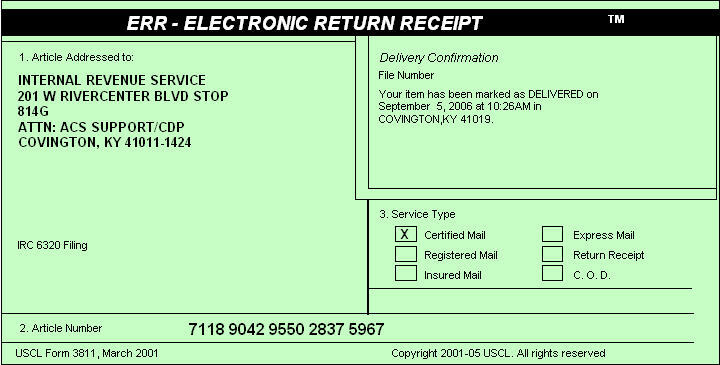 Certified Mail Envelopes with Electronic Return Receipt will save you time and money! No written forms or labels are used. Log into our web site to address and print USPS Certified Mail® article numbers and barcodes. You print your address page on your local printer using plain white paper. Insert this address page into our special window Certified Mail Envelope. Just add your letter pages and drop it in the mailbox. No written forms or labels are used in our patented process. Each envelope includes “in-route” letter tracking and Electronic Return Receipt – ERR™ to save you money. We support USPS Certified Mail® Return Receipt Requested that provides ERR – Electronic Return Receipt & Signatures returned to you in PDF file format. Save time and money with our certified mail automation. Outsource your mailing through our regional print network to provide same day printing and mail entry of your compliance letters and variable letter data. Our regional printing and mailing service providers are experienced in USPS Certified Mail transnational data processing and mailing requirements. Our certified mail printers can automate USPS Certified Mail® including ’HIPAA’ compliant regulations and high volume business and commercial mailings.